What happened to air traffic on the morning of 9/11 was unprecedented. Within hours of the attacks on the World Trade Center and the Pentagon, and then the crash of United 93, the only aircraft left in the air over the continental United States were operated by the military, the government and official rescue units. Time lapse images of the flow of private and commercial aircraft over the country show flights beginning to disappear from the screen within minutes after the grounding order was issued. No one could know it at the time, but the stand down would last for days for general aviation, with only IFR traffic being allowed back in the air as the following weekend approached, and only with exceptionally tight restrictions. Commercial traffic had begun shortly before, with airliners once again painting their white trails across blue skies that had remained remarkably clear of the evidence of air travel for the first days following the attacks. This is all common knowledge and now part of aviation lore. What is little known is the story of the flight of a Cessna that took off from an airport in Oklahoma on the night of 9/11 and made its way to Louisville, Kentucky. It was not the flight of a pilot who had somehow missed word of the grounding, or who had chosen to ignore the order. It was the flight of Doug Vincent, and it was a mission of mercy fully sanctioned by the FAA. 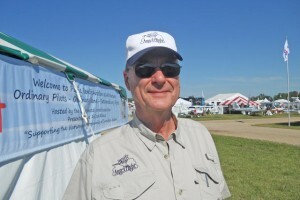 Since choosing to donate his time and the use of his plane to Angel Flight of Oklahoma, Vincent estimates that he has flown nearly 400 missions, taking people to cancer centers in Houston, or on sad but rewarding final flights from sterile hospital rooms to the familiar surroundings of their home so that they can spend their last hours surrounded by family and friends. Each flight is a gift in the best sense of the word, and it’s clear that Vincent feels that he receives more than he gives. And so it was that years of helping build an aptly-named organization in Oklahoma led to a singular flight in his Cessna 210 on the night of the darkest day in the aviation history of the country. Once the mission of moving blood supplies to New York and Washington had been planned, the next step for Vincent was figuring out how to get a clearance on a day when all general aviation and commercial flights were not allowed to fly. Vincent called a contact in Washington and was told there was an exception for military and medical flights flying with a special transponder code. Another call to Flight Service provided guidance that once he filed a plan, Vincent could call the tower for his discrete code. The first call to the tower didn’t work and he was advised to call approach. Finally a controller provided him with the special procedure that would allow him to depart from Tulsa for Oklahoma City where he would pick up the blood supplies and his friend Mark Hayward who would serve as his co-pilot. In the meantime he had removed all of the seats from his Cessna 210 in preparation for the flight that was to begin at 9PM. From a departure just after darkness fell on 9/11, to their arrival back in Oklahoma as the sun rose the next morning, the round trip had Vincent and Hayward sharing flying on the most unforgettable of nights. It was a night when hundreds of millions of other Americans, and countless millions more around the world sat stunned in front of televisions. And a night when just a few volunteer pilots sat in cockpits, radios quiet, and with plenty of time to think about what had happened just hours earlier in New York, Washington, DC and Pennsylvania. The contrast couldn’t have been more stark and well-defined. On an achingly clear morning aircraft had been used as instruments of terror, and just a few hours later, they were being used as vehicles of hope. Later, Angel Flight of Oklahoma and the Volunteer Pilots Association would share the first Public Benefit Flying “Teamwork” Award in recognition of their service in flying relief missions after 9/11. Doug Vincent is modest about his role in the flight on 9/11/2001, saying that it was one of the many significant flights of his career of volunteering to help others. But as he pauses to think about answering the question, it’s obvious that the memory of that one quiet night of flying is still powerful and emotional, and that he considers himself fortunate to have found a way to help.